Journey through our 12 themed zones, to admire over 10,000 creatures that call Sea Life Melbourne home including huge sharks, massive sawfish, mysterious stingrays, jellyfish, feathery Sun-Antarctic penguins, majestic seahorses and our resident croc Pinjarra! While you’re here; have a go at creating your very own sea creature and watch it come to life in our huge nine-metre virtual ART aquarium. Also, be sure NOT to miss our Ice Age: No Time for Nuts 4D cinema experience all included in your admission. 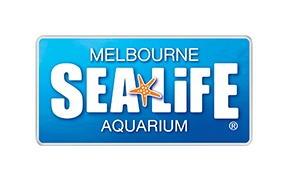 For more information on what you can find inside SEA LIFE Melbourne, please visit here. Download our attraction map here.